MNA – Iran’s Ambassador to the UN Gholamali Khoshroo says that the United States is addicted to sanctions and seeing it as a tool in pursuance of its own national interests. 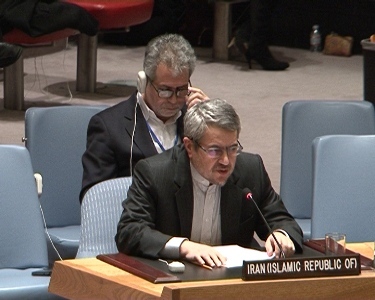 Gholam Ali Khoshroo , Ambassador and permanent Representative of the Islamic Republic of Iran made the remarks in New York on October 12, 2018, before the Sixth Committee of the 73st Session of the United Nations General Assembly On: “Report of the Special Committee on the Charter of the United Nations and on the Strengthening of the Role of the Organization” (Agenda Item 85). The Islamic Republic of Iran continues to attach great importance to the role and activities of the Special Committee. The Charter of the United Nations has established an international order of multilateralism with our Organization at the center. Further the Special Committee is the only enduring mechanism within the UN framework to discuss issues related to the UN Charter and strengthening of the role of the Organization. The Committee is entrusted to address the important issues related to international peace and security as well as pacific settlement of disputes. Prohibition of the threat or use of force as enshrined in the Article 2(4) of the UN Charter has been an essential achievement of the United Nations. However, the practices of few Member States to unlawfully resort to threat or use of force has been in defiance of peremptory norms of international law and has questioned the credibility of the organization in violating the UN Charter. Clarification and re-affirmation of Charter Provision in respect of the use of force could contribute to strengthening of the organization. Thus, it is regrettable that a few Member States are opposing the proposal submitted jointly by the Russian Federation and Belarus to seek, through the General Assembly, the advisory opinion of the International Court of Justice on legal consequences of the resort to the use of force without authorization by the Security Council, except in the exercise of right to self-defense. The Charter Committee also provides an opportunity for Member State to hear from the department of Political Affairs regarding all aspects of the Introduction and implementation of sanctions imposed by the United Nations. We note that the capacity of the Secretariat has not been sufficiently developed to be able to fully assess the short-term and long-term socio-economic and humanitarian consequences of UN sanctions. There is a need to enhance the expertise and capacity of UN Secretariat to enable it to properly assess the unintended consequences of the UN sanctions on civilian populations. Moreover, the Security Council sanctions may be introduced only as a last resort; after determination of the existence of a real threat to peace or breach of peace and based on valid evidence , not mere speculations and misinformation. Sanctions imposed pursuant to arbitrary and politically motivated determinations of the notion of “threat to the peace and security”, should not be seen as legitimate and lawful. Nowadays we are witnessing a new and surprising trend of openly using threats against countries as a tool of foreign policy. One could trace the manifestation of this policy in the UN as well. Threatening to cut financial aid to those countries who voted in favor of a UN resolution or warning them against the possible consequences of their vote in the General Assembly by saying: “the US taking the names” is just one example of visible offense to the UN principles. One thing is clear. This trend is weakening the organization, not strengthening it, and runs counter to the very objective of the Charter Committee establishment. Another discouraging account regarding the UN Charter and international legal order is that, in total disregard to Article 25 of the UN Charter, a permanent member of the Security Council is not only violating council resolution 2231 for the first time in the history of the UN, but also engaging in penalizing nations across the entire world for abiding by that resolution. Today, more than ever, this country is addicted to sanctions and seeing it as a tool in its toolbox in pursuance of its own national interests. The morally wrong and ethically unjustified unilateral measures not only defy the rule of law at the international level but also infringe upon the right to development and lead to the violation of basic human rights. The Islamic Republic of Iran welcomes the report of the Special Rapporteur on the negative impact of unilateral coercive measures on the enjoyment of human rights contained in document A/73/175. We lend our support to the practical steps that he has suggested and endorse his recommendations. Particularly where he calls upon States to clearly affirm that unilateral sanctions, especially those of a comprehensive nature, in particular when aggravated by secondary sanctions seeking the “economic isolation” of the target country, amount to discrimination against the innocent population of the country concerned, in violation of the prohibition of discrimination enshrined in the main international human rights instruments including, but not limited to, the International Convention on the Elimination of All Forms of Racial Discrimination. The Islamic Republic of Iran welcomes the decision of the Special Committee to hold an annual thematic debate on means for pacific settlement of disputes in line with Article 33 of the UN Charter. My delegation shared its experience with the member states in the Charter Committee, with respect to using “negotiation” as an effective means for solving unnecessary crisis. In the course of the said thematic debate, we elaborated on the extend of diplomacy and negotiation in leading to a win-win and satisfactory agreement for the parties involved as well as the international community. The conditions which led to the successful conclusion of the JCPOA were, among others, mutual respect, equal footing and willingness of the parties to work on the basis of common interest and common objectives. Today, although one of the essential participants of the JCPOA has withdrawn from the deal, it still is alive, due to the power of diplomacy and negotiation. However, the US has not only withdrawn from the deal, but also spared no efforts to spoil the deal by exerting its political and economic influences. The current US administration, declared the re-imposition and aggravation of an extensive set of sanctions and restrictive measures targeting Iran, its nationals and its companies. In conclusion, my delegation expresses its appreciation to those delegations that put forward valuable and productive proposals during the previous Sessions of the Special Committee. We consider the specific proposals on the agenda of the Special Committee that deserve in-depth consideration, and we invite all to engage in constructive dialogue for better improvement of the work of the Committee. We reiterate the need for genuine political will in order to advance the long-standing issues included in the agenda.